Asma al-Mohattwari-almotamar.net - Food insecurity and malnutrition continue to negatively affect the social and economic development ofYemen, where the rates of unemployment, poverty, school dropouts, and child mortality, is increasing. To alleviate this problem, some international organizations in cooperation with local institutions have tried to provide support and assistance. Last week, teams from the School Nutrition Project at the Ministry of Education started the distribution of food aid to poor families as part of the implementation of the nutritional support project provided by the World Food Program, which also has additional benefits for girl’s education. Considering that more than 10.5 million people are food insecure, and no less than 10 million people inYemensuffer from severe to moderate malnutrition, WFP representative inYemenand Country Director Mr. Bishow Parajuli wasn’t exaggerating when he recently described malnutrition as the “loss of an entire generation” of Yemenis. Parajuli presented that the food security update for Yemen, which revealed that 43% of population in the country can be classified as “food insecure” in 2013. Parajuli said that 10 million people are food insecure, with 4.5 million of those people being severely food insecure. The School Nutrition Project’s General Director in the Ministry of Education, Hamoud Mohammed al-Akhram, says that the assistance program aims to support the poorest families in remote areas. Currently, the nutrition project distributes food to 382 349 poor families spread over 114 districts in 8 provinces: Rima, Ibb, Hajja, Amran, al-Dhala, al-Baydha, al-Mahweet and Taiz. The total aid to be distributed is 19 827 tons, of which 19 117 tons are of flour, and 710 of oil. This means one bag of flour, and 5.1 liters of oil, for per family. 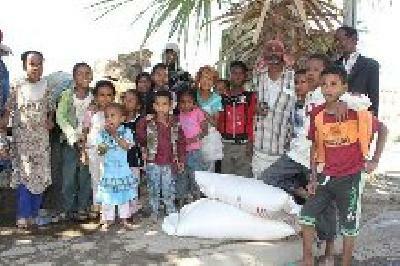 According to World Food Program, the program helps five million people inYemen. The targeted families have been chosen based on field surveys within international norms and standard, as well as indicators taken from the field. The program also seeks to specifically confront starvation among newborn children, pregnant and lactating mothers, and displaced people. The organization says that more than half a million children are malnourished, and that there are nearly 600 000 displaced persons from various conflicts inYemen. “The program also supports the local economy in Yemen. Recently, program begun to focus on purchasing materials locally to support the national trade and economy, as well as local transportation. It is also depends on the traders and potential that exists in Yemen,” Parajuli said. Additionally, the Ministry of Education has begun a girls’ education project in all provinces. There is a large gap between male and female education inYemen, with dropout rates being much higher among girls than boys. “Such projects motivate the families to re-send their daughters to school again,” al-Nuziali said of the World Food Program’s efforts at combating starvation. Parajuli also said that new projects designed to combat malnutrition will be implemented over the next year, which will encourage people to continue education as motivated by the provision of nutrition through the schools.